← I want a convenient way to convert URL to PDF, do you have it? If you have an image French PDF document which can not be edited freely and you want to extract all the French characters from this image PDF to Excel document. Do you know how to do? If not, please don’t worry. You just need to read this articles about how this questions and you only need to choose a suitable application to help you. There is no doubt that you will take the help of OCR (Optical Character Recognition) application to help you recognize the French PDF document. The application VeryPDF PDF to Excel OCR Converter is not only able to accurately extract the characters on your image PDF document but also can convert these characters to editable Excel format file. 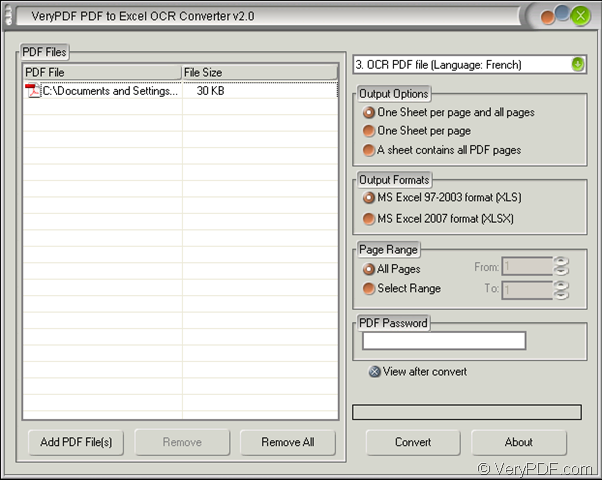 You can download PDF to Excel OCR Converter at its homepage where there are more introductions about this powerful application. This application supplies five kinds of licenses for different users with different purposes. When you need to use anyone of them, just purchase one (s) of them. Now please see the interface of PDF to Excel OCR Converter in Figure 1. 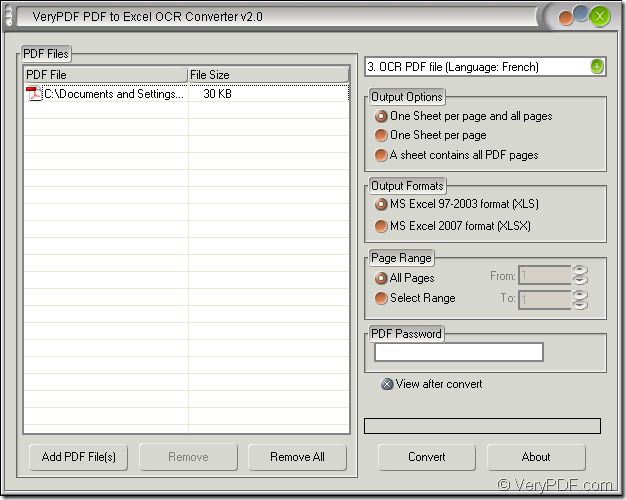 For seeing this interface, you need to open the application by double clicking the application icon or clicking “Start”—“All Programs”—“VeryPDF PDF to Excel OCR Converter v2.0”—“VeryPDF PDF to Excel OCR Converter v2.0”. You can choose “Setting parameters first” or “Adding document first” because you can use this application to set parameters before you add image PDF into its file list. When you add image PDF document to the application, you can click “Add PDF File (s)” to open the file picker window which is named as “PDF to Excel” from which you can choose the image PDF to be converted. You can also drag the file into file list directly. To recognize the characters in French PDF, please choose the 3rd option in top right dropdown list—OCR PDF File (Language: French). To get a satisfied output layout, please check a suitable one in “Output Options” group box. In “Output Formats” group box, you can select the output format as “XLS” or “XLSX”. “Page Range” group box allows you to set the page range for source file and convert the specified pages into Excel file. Please click “Convert” button to open “Save as” dialog box at last. Choose the output location and input the name for the target file in “Save in” dropdown list and “File name” edit box. Then click “Save” button to run the conversion fro image PDF to Excel. So all the operations for this conversion are shown done. Now you can download one free trial version of PDF to Excel OCR Converter to do it yourself and if you are convinced by its powerful functions, you can purchase the official version then. This entry was posted in OCR Products and tagged French PDF, image PDF to Excel. Bookmark the permalink.